When you have data at your fingertips, you have the power to create truly remarkable marketing campaigns. With help from Omnicore Agency, you can tackle your greatest business challenges with insight like never before. You can make landing pages that keep people on your site – and convert. You can design promotions with knowledge of who your visitors are and where they come from. You can make decisions about your business based on actionable feedback. All of this and more can be in the palm of your hand when you make the time for analytics. If you have a website, you need analytics. Period. 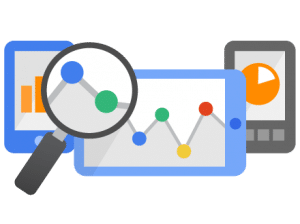 Google Analytics Setup: Start getting the data you need to make smart marketing decisions with an installation of Google Analytics. It’s a powerful tool in every business toolkit. Campaign Tracking: You have the tactics in motion – but are you tracking them correctly? Find out what’s working and what’s not with our campaign tracking solutions. Multivariate and A/B Testing: Testing is a critical ingredient in your success. We’ll help you craft strategies and testing scenarios so that your website is optimized from the inside out. Custom Analytics & Insight Reporting: Solutions as unique as your business. We’ll create a personalized strategy that’s tailored to your goals and objectives, so you can make the most of your data. Every business needs actionable feedback. We’ll help you discover the missing opportunities for data in your digital marketing strategy. Our analytics tools, tips, and analysis can guide you toward success – and we’re not just saying that because we geek out over metrics. Analytics drive your marketing strategy, so it’s important to make them part of your digital marketing plan now – before reacting blind. Get in Touch to share What Your Business is Struggling With!